Recycling does not have to be for aficionados of tofu burgers or the goat’s-hair-sock-in sandal-brigade. I call for glamorous recycling with a Midas touch. After some horrific sisterly squalls in which it transpired Puffy had found a dose of suppositories and was attempting to self administer – if at an incorrect angle – we regained domestic composure. Effecting family bliss, we went outside to spray fir cones to affix to our Bethesda Chevy Chase High School Boating Club wreath. Alexander got gold fingers and everyone was delighted at this near re-enactment of James Bond. The pumpkin was staring at us. Even the squirrels seem to have taken a dislike to the taste of it after only one very meager morsel. You cannot have a Christmas wreath and a Halloween pumpkin but what about a metallic gold pumpkin? I tell you Cinderella could do no better, nor could her fairy godmother. It is resplendent. 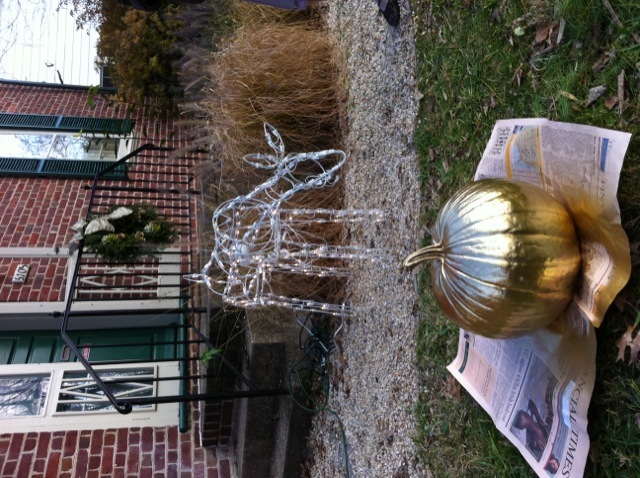 We pulled out the nodding reindeer to give our gilt pumpkin some back up. Four years ago I dared myself to buy this creature from Home Depot and have gone from embarrassment to unmitigated affection. I have told my husband that when we move back to Europe we will need to take my little friend with us and make it work on the European power grid, whatever the cost. We will be the talk of the town. I could import its friend and relations and revolutionize gardens throughout the continent. And so it was, with great sadness, that I realized the deer has lost its power for thought. The head, nose and even ears are devoid of active fairy lights and the nodding will be invisible to anyone who is not involved in an amorous embrace with the creature. I felt like giving it such an embrace, as a final tribute. But at least the gilt lingers. This entry was posted in Biro & Pad: Jottings and tagged Christmas decorations, Recycling. Bookmark the permalink.